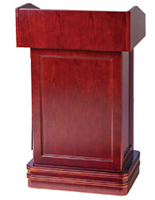 As the main focus on these lectern offerings, our cherry wood podiums feature a species used in woodworking the world over. 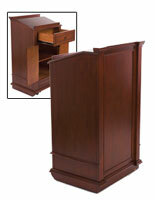 Commonly used for furnishings and floors, cherry is a beautiful hardwood that simply gets better with age. 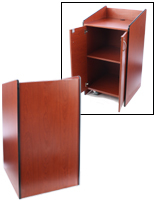 When the material is cut it shows a light pinkish color but quickly changes to a rich reddish brown, especially when exposed to sunlight. 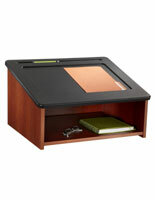 Over time, the wood continues to darken which adds to its beauty. 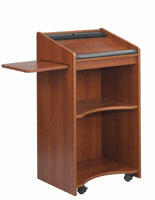 These cherry podiums come in a wide variety of real wood veneer and plastic laminate models. 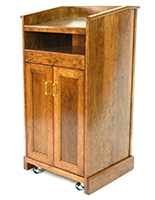 The veneered lecterns are the most expensive due to their hand-built construction and clear-coat finishes. 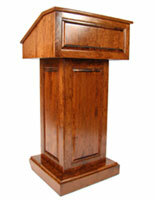 Podiums of this caliber are best suited in upscale environments for both religious or secular applications. 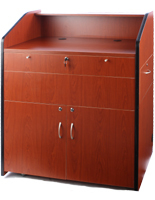 We also offer a couple of interior styles with plastic laminate construction. 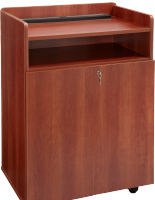 While providing the appearance of real cherry wood, these lecterns offer extra durability and scratch-resistant surfaces. 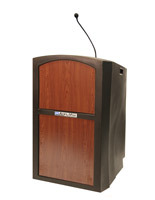 Suitable applications include lecture halls, conference rooms, and schools. 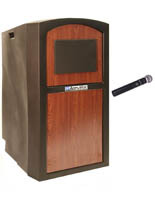 A large number of podiums offered here are designed for outdoor use. 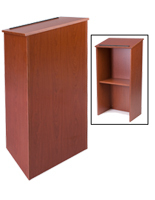 These feature molded plastic bodies with cherry laminate accent panels for added style. 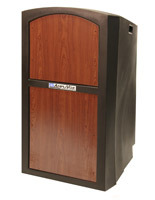 Virtually indestructible, they will withstand the elements while providing years of service. 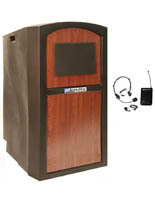 Various options such as amplified speakers with wired or wireless mics are available that help to project the speaker's voice in exterior conditions.